If low aerobic exercises with a balance pad is not your thing, then using a balance board may be a better option. Compared to balance pads, balance boards offer more of a challenge when it comes to balance and vestibular training. Balance boards are typically made of a tougher material that can withstand more abuse from activity as you train. Some balance boards can come in different shapes and sizes as well as different difficulty levels. Take for instance our MVP® Balance System. This balance system comes in 4 different non-skid platforms and offers 5 different color-coded instability balls to choose from. Easily customize your balance board by screwing in your desired instability ball. You can either screw in one ball to create a wobble board, or two to create a rocker board. Each instability ball has a different level of challenge and progressively offers a greater balance challenge as you move from yellow all the way up to black. For a cheaper but less customizable approach, we also offer the CanDo® Economy Board. The Economy Board is a slip-resistant wobble board that makes training fun. Wobble back and forth to improve balance and increase muscle tone whether your using it for your legs or arms. 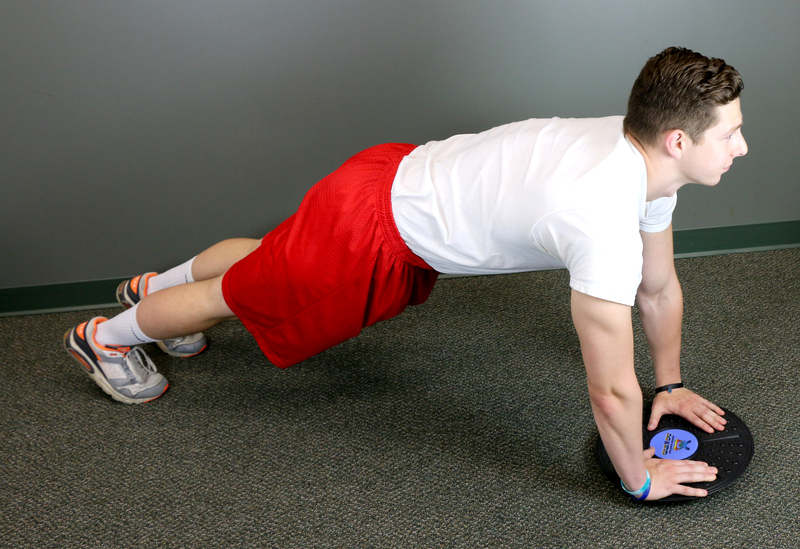 Stand on the board to train your balance, or use it on the floor to enhance push-ups. This wobble board not only improves balance but also range of motion and reaction skills. It’s great for people who want to strengthen and condition their body. Balance boards are an excellent choice for those who want a fun but challenging balance training experience. With either balance board you can act like you are snowboarding at the Winter Olympics! Before training with a balance board, consult with your specialist to see if a balance board is right for you. To check out our line of MVP® Balance Systems, click here. To check out our CanDo® Economy Balance System, click here.